The Baltic Dry Shipping Index came to prominence at the start of the Chinese-led commodity supercycle around a decade ago. 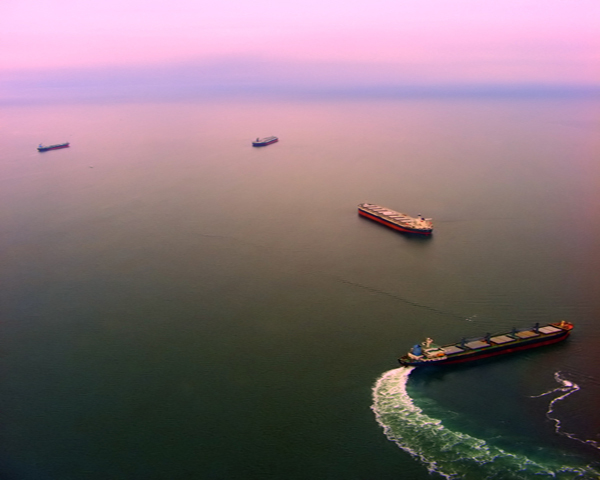 The London-based Baltic Exchange tracks the cost of moving commodities along more than 50 routes around the world and the BDI is considered one of the go-to barometers of the global economy and a leading indictor of commodity prices. In November 2015 the index dropped to the lowest since 1985 when Baltex started tracking the data. The index came roaring back in the second half of 2017, hitting a five year high. But that all changed mid-December and despite a recent uptick the BDI has dropped 32% since then. 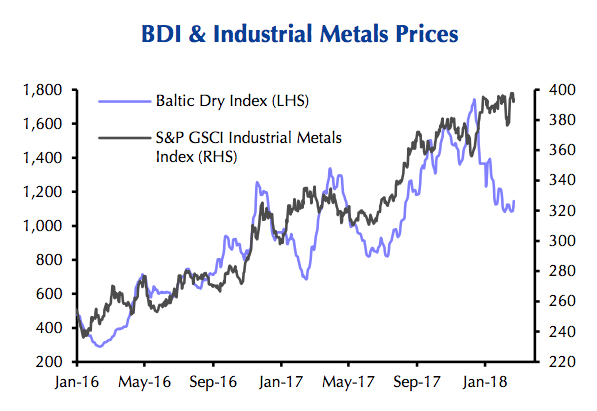 "If we assume that at least part of the fall in the BDI is a reflection of somewhat weaker demand for seaborne industrial commodities, then the strength in industrial metals prices appears unsustainable. "The BDI may find support this year as growth in supply of new ships slows and China shows a preference for high-quality imported commodities. "However, this does not stop us from forecasting that growth in China’s overall commodities demand is set to fall this year, which will act as a drag on prices." Northern China import prices for iron ore climbed to just under $80 a tonne last week, close to the highest level for the steelmaking raw material since April last year. On Friday the BDI was at 1,185 points and the nadir of 519 little over two years ago coincided with multi-year lows in iron ore ($37 a tonne) and other bulk commodities. Base metals also bottomed late 2015/early 2016 with copper – also a good gauge of global economic health – hitting six year lows under $2.00 a pound ($4,300 a tonne). The index peaked at 11,677 in May 2008, but never recovered following the global financial crisis, despite the continued growth in world and Chinese bulk trade. Even when taking into consideration seasonal factors the recent fall was "particularly large and is hard to explain by temporary factors alone"
Of the freight rates tracked by the exchange, those for Capesize ships provide the best insight into the health of the Chinese economy. Capesize vessels can haul roughly 160,000–180,000 tonnes and are the dominant vessels for the world's 1.4 billion tonnes seaborne iron ore trade. Iron ore represents more than a fifth of the global dry bulk trade and is the second most traded commodity after crude oil and ahead of coal. The surge in iron ore trade beginning a decade ago translated into a massive boost for daily earnings for Capesizes, the largest ships tracked by the index and so called because these vessels cannot use the Panama Canal. Capesize rates topped out at an eye-watering $234,000 in June 2008 but has gone as low as just $4,015 a day.